It was so nice to see seventeen boats out racing tonight. While scanning the pre race start area, I noticed that many of the racers had tucked in a reef prior to the start in anticipation of a building southwest wind. During this time the wind was SW at 15 knots with higher gusts. It was a borderline call as to whether or not to put in a reef. Shortly after the start the winds began to moderate and we noticed that most of the boats were shaking out their reefs. Lady in Red is the last boat to start in these pursuit races so we noticed a trend for lighter wind before actually starting. Tonight's forecast was calling for the wind to continue to hold for at lease a few hours before gradually falling off, we thought course #13 would be perfect. (start, 6, 11, 10, 3, finish) As the first third of the fleet was approaching the first mark, the wind had dropped to about 8-10 knots. During the downwind leg to 11, the wind was slightly lighter. Integrity was leading a group of four boats but was struggling to keep their genoa full. They were being chased down by Pandemonium, Aleboat and Lady in Red who were steadily gaining on Integrity as the wind speed continued to drop. 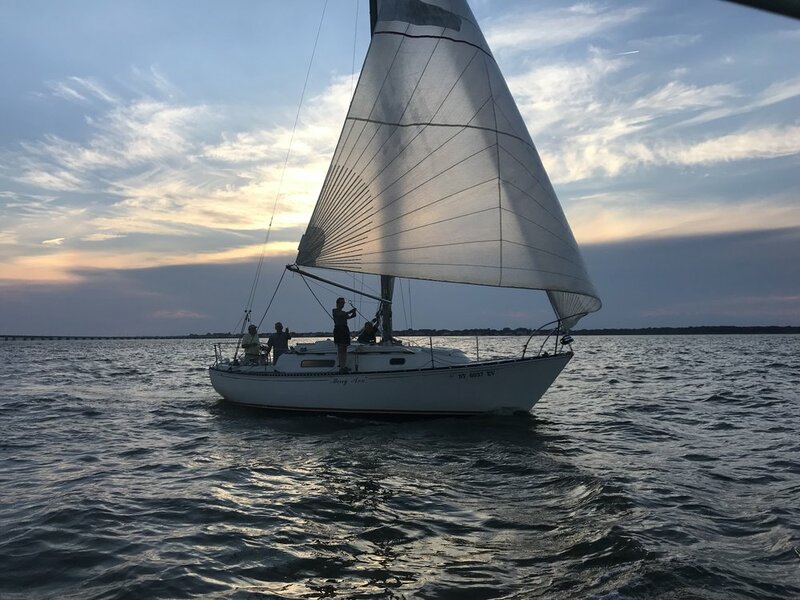 It remained fairly steady at 5-6 knots until the first 3 boats, Fresh Start, Merry Ann and Jolly Mon rounded buoy #3 and were heading to the finish. The wind filled in nicely and most of the fleet finished racing in an 8-11 knot breeze. I was sorry to learn that some of the racers decided to drop out just before the wind filed in for good for the remainder of the race. It was great to see the return of Jubliee, sailed by Rebeca Russo and Czech Mate sailed by Chris Dennerlein out there racing with us for the fist time this season. Unfortunately, Chris had to do some major repairs to his boat this spring. Just in case you don't remember the story from last season, Chris nearly lost his outboard engine when his motor mount was torn off his transom on a very windy evening race with big steep chop. It was a beautiful evening of racing on the bay for most of us but the excitement for Chris Dennerlein didn't end at the finish line. At the after race get together, we were all sitting aground eating, drinking and conversing while Chris was tying up his boat Czech Mate for the first time this season. It was launched just in time to allow him to race tonight. His late season launch was due to the transom repairs that he recently completed. While Chris was tying up his boat he fell off and ended up in the water. Fortunately he wasn't too seriously hurt and he managed to pull himself up onto the dock. It is frightening to realize that Chis had fallen into the water less that 50 feet from where we were all sitting and nobody noticed. He did report that the water was warm but he much prefers a sandy bottom over knee deep mud. Thank you to JV Phillips and crew for "volunteering" to be race committee tonight and for the fresh seafood you shared. Did you harvest those clams while on RC duty? Thank you to Bill Cook for donating the beautiful storage box for the after race get together "club house." It's sincerely appreciated. At first we though it might be full of beer and were disappointed to learn that there was none. But, it wasn't empty. 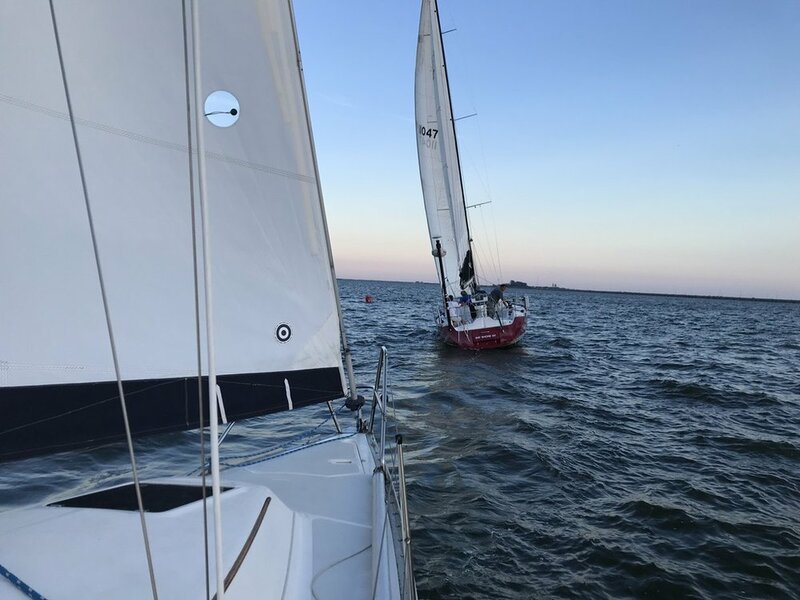 It was full of appreciation for the Tuesday night race venue, gratitude to all of you who contribute and admiration to the competitors who participate and share this passion for sailing with strangers, friends and family. Much better than beer! Thank you all for participating tonight and we hope to see you again next week. Stay safe.